Through continual refinement, minor tweaks, and small advancements, breakthroughs can happen. For Ortovox, this happened in the case of the Pro Lite Shovel. By starting with the highest quality materials, Ortovox has made no compromises in functional capacity. This remarkably light, compact, and packable shovel has a 6061 T6 aluminum blade that features subtle notches and ribs that increase its stability and strength while reducing mass. The telescoping handle features unique cross-sectional shaping that increases strength over ordinary rectangular or circular tubes and can be oriented for left or right handed users. When you are looking to keep your pack weight as low as possible, the Ortovox Pro Light Shovel allows you to do so without feeling that you have compromised the safety of your group. 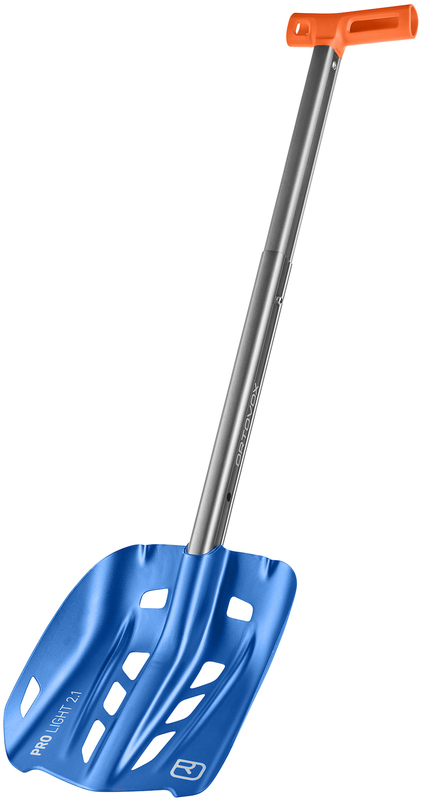 Shovel blade can be fashioned into a rescue sled or snow anchor. Subtle ribbing and tube shape enable high strength with low mass. Telescoping shaft locks into place without fiddling with buttons. Compact size is sure to fit in space-challenged ski packs. Notes Light, compact, and strong!